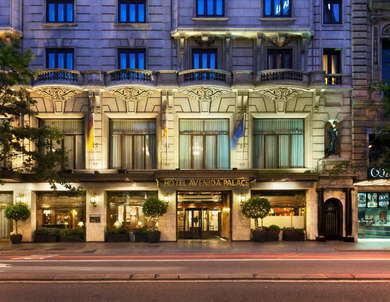 Opened in 1952, this classic and elegant hotel is an icon of the Barcelona hospitality scene and has hosted famous guests like Ernest Hemingway, Joan Miró, and even The Beatles. Greeted by men in top hats and tails, the refined space is decked out in polished marble and Renaissance design that helps its customers achieve a regal feeling throughout their stay. Warmly styled rooms have maple wood flooring, white and blue walls, and a smattering of balconies (request ahead). All rooms come with free bottled water, take-home slippers, and plush robes. Suites have Nespresso coffee makers and stellar views of the Gran Vía below. One of the most unique rooms in the city is The Beatles-themed suite. This is where the famous band stayed when they played in Barcelona back in 1965. You’ll find a mix of shower/tub combos or solo showers as well as the occasional bidet. Standard bath products are by Ritual while suites have Ferragamo. The heart of the hotel, the lobby is a stunning work of art with polished marble floors, an opulent rotunda, brass fittings, and ample couches and chairs that are ideal for late day tea or all-day meetings. Under the rotunda is a grand staircase that’s a replica from the Palace of Versailles (and it shows). Head to the back of the lobby where you’ll find the Beat Bar – a brooding, blue leather cushioned spot named after The Beatles and where you can see the Fab Four in pictures from their stay at the hotel. The rooftop pool is heated year-round and offers epic views of the city. You won’t be swimming any laps though as it’s not really that big. Only available during winter months, there’s a small gym (literally three cardio machines) on the roof of the hotel. Ask the front desk about running routes in the city. Evidently the owner has it down pat. There’s a breakfast buffet from 7 to 11 am that’s complimentary if you book directly through the hotel’s website. Off the lobby is Beluga, an excellent Mediterranean spot for lunch and dinner that also features live music throughout the week. There are a few different drinking areas of the hotel. In the lobby there’s Casa Llibre and Beat Bar. On the roof there are also multiple outlets and live music and/or DJs that play on summer Saturdays. The hotel is in one of the most central parts of the city and just a couple minutes from two different metro stops. It’s also right off a main thoroughfare so hailing a taxi or catching a local bus is incredibly easy. Walking in this area is great as you’re minutes from Las Ramblas and right off Passeig de Gràcia where you’ll find dozens of bars, restaurants, shops, and attractions. For a little bit of everything, check out El Nacional (3-minute walk) which has four different restaurants that encompass the entirety of Catalan cuisine. For the highest of high-end dining, head over to the Mandarin Oriental for Moments (4-minute walk) a two Michelin-starred spot, widely considered one of the best in town. If you stick around at El Nacional (3-minute walk), you’ll also discover four separate bars that serves wine, beer, cava, and cocktails. Right next door to the hotel is a kitschy spot called Obama English Pub (1-minute walk) which has a great beer selection and finger food while paying homage to the former US president. All class all the way, El Avenida Palace is an elegant hotel with a super high level of service and a refined atmosphere throughout. From the moment you arrive, you’ll be bathed in a regal setting and be able to gawk at the shiny marble and epic staircases. Surprisingly there’s no spa, but there is a little bit of everything else, which should keep you well fed, liquored up, and pampered. Between the history, the 360-degree view rooftop, and the service, this is an ideally located spot that’s worth the price.